Bill Fraser became an active member of the Manitoba Historical Society as a young teacher in the 1960s. He first served on the Executive as Treasurer in 1967 when Joe Martin was President. Bill has attended MHS Council meetings since that time. He remained on the Executive in various positions into the1970s. Subsequently he edited the Manitoba Pageant from 1973 to 1979 and also chaired the Margaret McWilliams Medal Committee for several years. 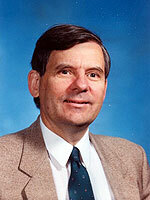 He rejoined the MHS executive in the mid-1980s and served as President from 1990 to 1992. He has been editor of the MHS newsletter, Keywords, from 1994 to the present. From 1995 to 2003 he chaired the MHS Museums Management Committee which was responsible for Dalnavert and Ross House and was an executive member providing liaison with the museums. Bill’s career in education included 33 years teaching history, geography and English at Daniel McIntyre Collegiate in Winnipeg. He and his wife, Shirley, have three daughters and two grandchildren. Now retired from teaching, Bill continues to enjoy his involvement with MHS.